This entry was posted on July 10, 2013 by Andie Pantazi. The days before a graduation ceremony are one hectic roller coaster ride for the students, their families, and the staff of the school. Feelings of excitement commingle with stresses and worries. We would like to make this hectic time easier for you, and below we have compiled some frequently asked questions regarding graduation attire and the accessories you might need. From doctoral graduates celebrating their years of hard work to a high school graduate eager to start university, the information below should be helpful in preparing for your graduation and enjoying your graduation day to the fullest. 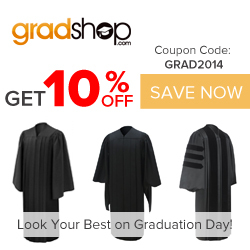 What should I wear to a doctoral graduation? Graduation ceremonies for doctorates are among the busiest and most highly anticipated, simply because a doctorate is the highest educational level one can get. Doctoral students should comply with the university regulations regarding what to wear on graduation day. This is because the university will naturally be anxious about sticking to tradition and making the commencement exercises flow as smoothly as possible. Parents and relatives joining the ceremony should do their best to wear semi-formal to formal clothing. Graduating students need to make sure their graduation robe, cap, and academic hood, stole or cord are all accounted for. Perform a double check to see that you have all these garments with you before you leave the house. For a full picture of all the ornaments you might need to wear, check out the GradShop academic dress gallery. Family members should do their best to ensure that they are helping the graduate stay focused and calm during this process. Mobile phones and cameras are necessary. If possible, an emergency kit containing needle, threads, double-sided tape, and other handy tools should also be brought along. What should I do during the commencement exercises? Graduation ceremonies are formal events, and you do not want to be the person interrupting the event. Mobile phones should be turned off or at the very least kept in silent mode. Camera flashes should be disabled unless the university declares that they are acceptable. Excited parents should stay in their seats unless otherwise informed by the ushers. The students should also be on their best behavior, especially doctoral grads who may find it hard to sit still from all the high spirits. What should I do after the graduation ceremony? The university may have prepared some activities for the graduates after the commencement exercises, and it is only after the formal rites are done that the students can really let loose. Graduation robes can be taken off and caps thrown in the air to celebrate this momentous occasion. However, make sure that you don’t lose your robe, hood, and cap. If you are renting them, you need to return them soon, and if you bought them from www.GradShop.com or elsewhere, you will naturally want to keep them for the special memories they hold for you. The after graduation party celebrations can then start, and the graduate and his or her loved ones can then enjoy the rest of day.